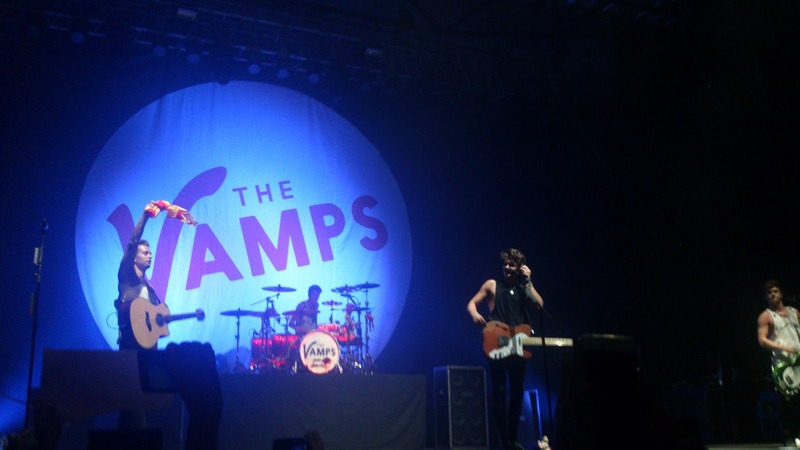 A month ago today, The Vamps were playing in Barcelona. It was special because it was the first time that I went to a concert with one of my friends from my old school and I also got to meet an internet friend and her friend and things that I never thought would ever happen in my life happened. It was around 6:30 am when my friend and I arrived at the venue. There were quite a few people there already, most of them had spent a few days sleeping there. We went straight to the last place of the queue and sat on the floor, we were ready to spend the whole day queuing. A while later my internet friend arrived and we met and it was amazing. Meeting internet friends is one of the best things ever. Exciting things started to happen after lunchtime though. Well one of them wasn't exciting, at least not for me, a tv channel came to film everyone in the queue and did some interviews, in front of us so yeah, I tried to hide behind an umbrella with the girls that were next to us (it was so sunny and hot). BUT let's move on to the exciting bits. We saw a big car with black windows and boys inside so everyone went crazy and went to see them as they got out of the car, it was The Vamps, I didn't see them though, just James and Tristan's hands and went back to my place in the queue. 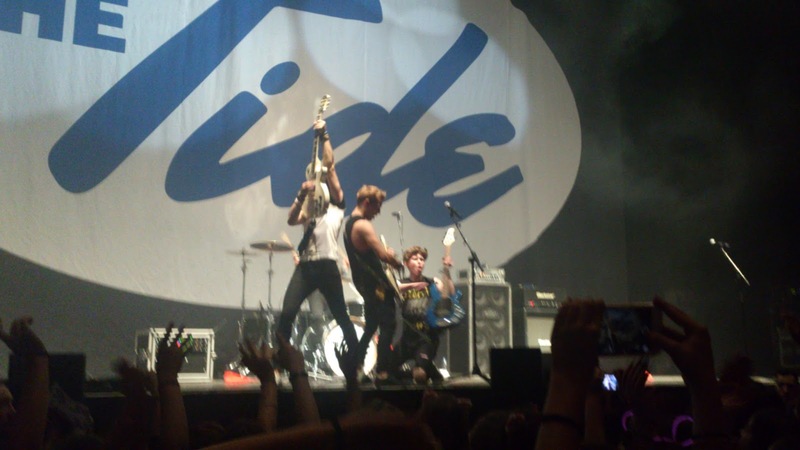 Then they did the soundcheck. 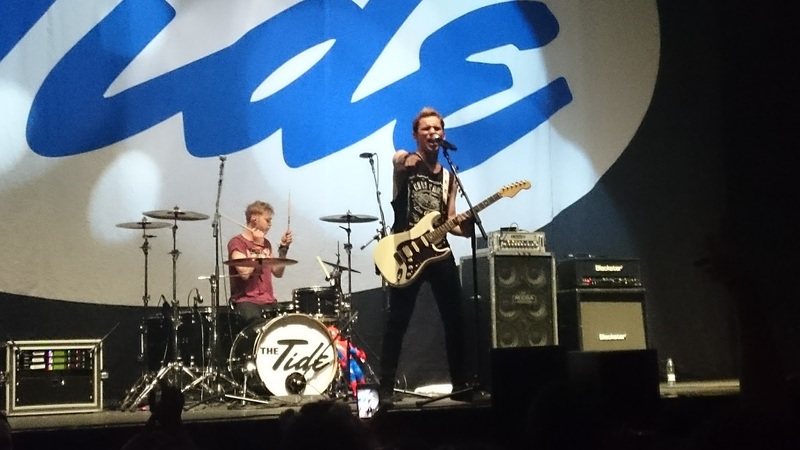 Later at like 3:15 pm another car arrived and it was The Tide, the support band, they are the first band The Vamps have signed to their record label. I saw them from afar and I was more than happy. I knew about them and checked their music out before the concert, you know just to see how they were and to be able to sing their songs. Then they all went inside and we thought they wouldn't come out again so me and my best friend decided to go to the toilets. Bad decision. When we were going back to the queue we heard screams. So we started running, I never run, and when we got there we saw that The Vamps where saying hi to fans and taking pics with them in one part of the fence. But everyone was going crazy and you couldn't even get to them. I started to go back to our place in the queue and I saw James from The Vamps was there so I ran again like I've never run in my life. I found a spot and I arrived in time for him to smile at me and grab my hand, I tried to hold onto his hand for as long as I could. He's so nice and beautiful I couldn't handle it. 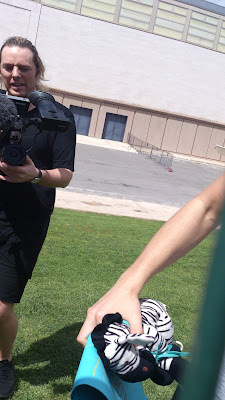 Also, Dean Sherwood, he records videos for them and all that stuff, filmed me so that footage has to be somewhere even if they never upload it. I went to my place in the queue and hoped for the rest of the boys to come. They didn't. Basically, because there was another fence and security or someone wouldn't let them come. It's weird to explain but you can see it in the photos. I felt pretty bad for not meeting the rest of The Vamps when lots of people got to meet them and take pictures with them but after all, they went out for us and I didn't think I'd even see them this close so I guess I can't really complain and I'm honestly really happy for the people that did meet them. Well, it annoyed me that 12 - 14 year olds were shouting about it and screaming and crying but whatever. Later on, The Tide came to say hi to us too and they did come to where we were. First came Austin and we asked him for a photo but security told us not to put our hands through the fence so basically he walked past us. Then the security guy walked away and Drew came so I asked him if he could take a selfie with me and my friend. He very kindly agreed and so he took the selfie. I never ever thought I'd ask for a selfie hahah Then we saw Nate coming but security told them it was time for sound check so he didn't and Levi was so far from us as well, they did wave and smile to us though. Also, Nate filmed a video that he later posted on twitter and I'm in it so that's something. Oh and earlier that day Levi tweeted that he'd be stalking instagrams and liking pictures with the hashtag #TheTide so I posted 2 and he liked one of them, bless him, he is so cute. After that kind of extreme fangirl moments we just had to keep waiting to enter, doors opened at 7:30 pm. We talked with the 3 girls that were in front of us which honestly were so nice and same age as us, I regret not asking them their twitters or something. But not everything was good, we all got pretty annoyed because people from the beginning of the queue, and some girls in front of the 3 girls we met, started to let friends in so basically there were more people in front of us aka if we were supposed to be on row 4 or so inside the venue, we wouldn't be any more. I mean I'm not gonna complain if you sneak 1-2 people but if it's 10 people or if everyone sneaks more than 2 people well, I just don't think it's fair for the people that have been there since early in the morning. Once we were in we found a good spot on the left side of the stage but still sort of in the middle. 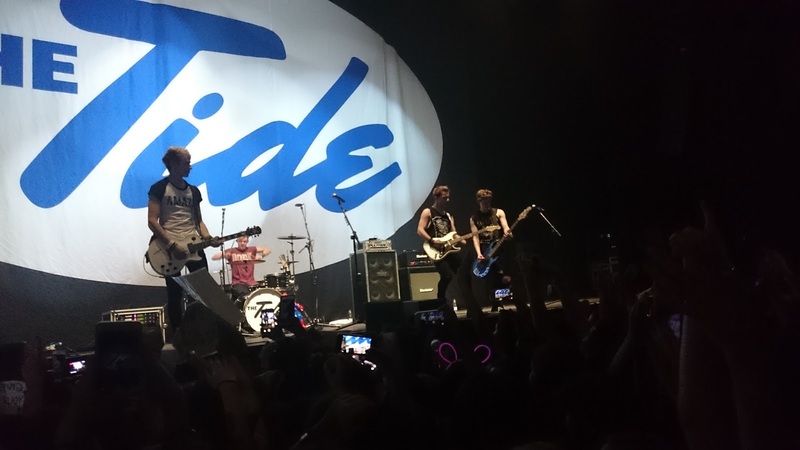 Eventually, The Tide got on stage and the concert started. I had seen their lives online and they were so good but I could never have imagined they would be THAT good. They played 4 songs, one cover which was Animal by Neon Trees and 3 originals: The rest of us, Falling in love tonight and What you give. Youtube them, you won't regret it. They are really nice and funny guys. 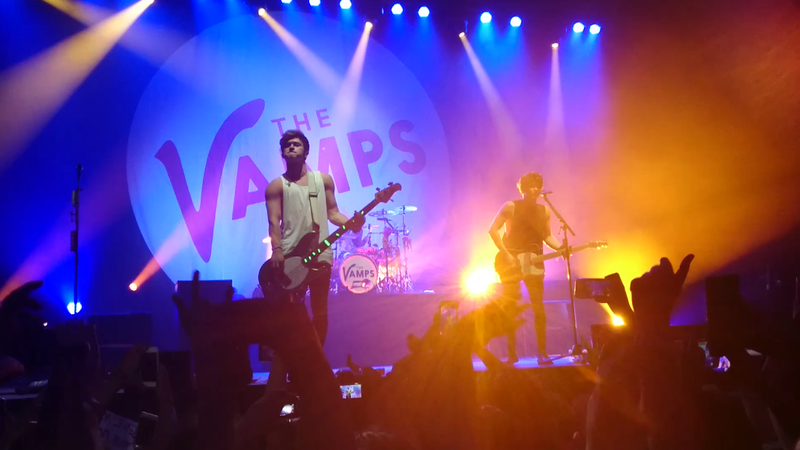 And yes, I grew to love a band in 2 days and since that night I've loved them even more, don't judge me. 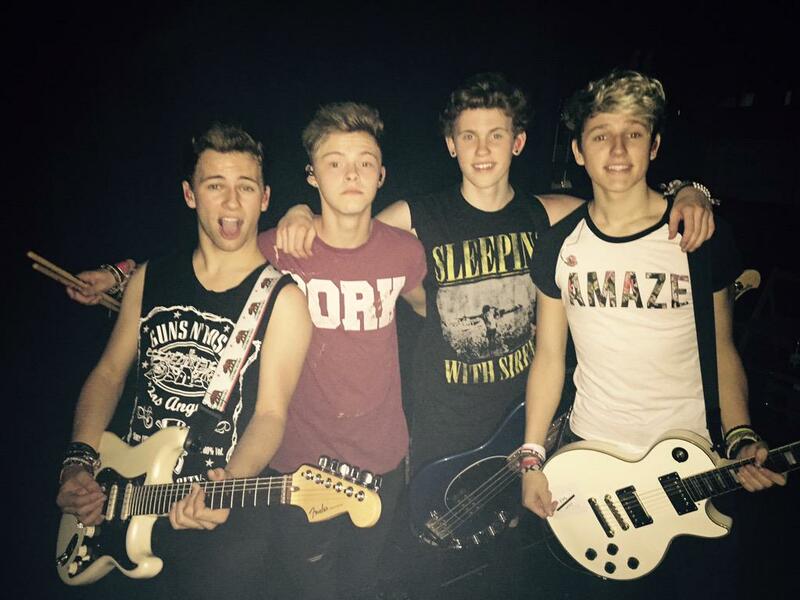 Also, we were told they filmed a cover backstage which you can watch here, it's Stitches by Shawn Mendes, it's perfect. 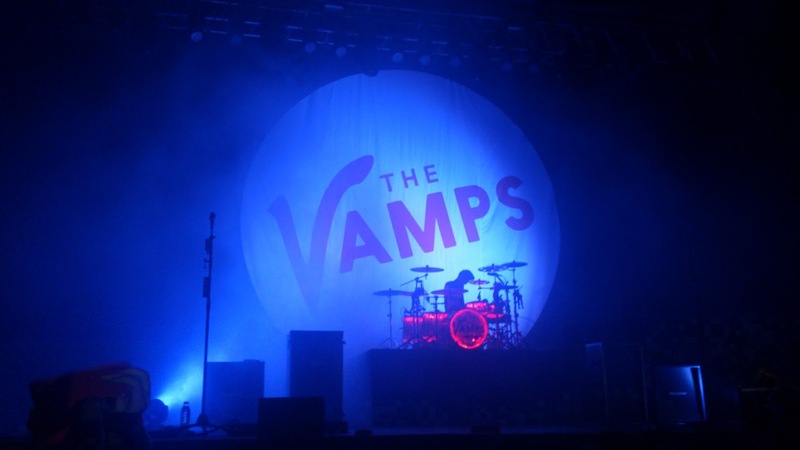 Then we had to wait a bit more for The Vamps but suddenly the venue's lights went out and stage lights lit up and they came on stage. Everyone screamed. They started playing, we started singing. We were so close to the stage it was unreal. I enjoyed every song, even Uptown Funk which I do not like. Funny fact of the day: they covered, well Connor sung, In Too Deep by Sum 41, and not many people knew the words but then there was me singing it like crazy. I love Connor's music taste so much it's so similar to mine. Also, I thought they wouldn't play Teenagers by My Chemical Romance and I went crazy and hyper again but this time most people did know the words. Another unexpected song (at least for me because I had seen the setlist and it wasn't in it) they played was Shout About It, which is one my favourite songs of them along with Risk It All, so I was pretty emotional. Oh, and James sang Move My Way beautifully and I like to think he smiled at me and looked at me in the eyes though it was probably to everyone in my area. I also almost get his guitar pick but the girl in front of me got it *sighs*. 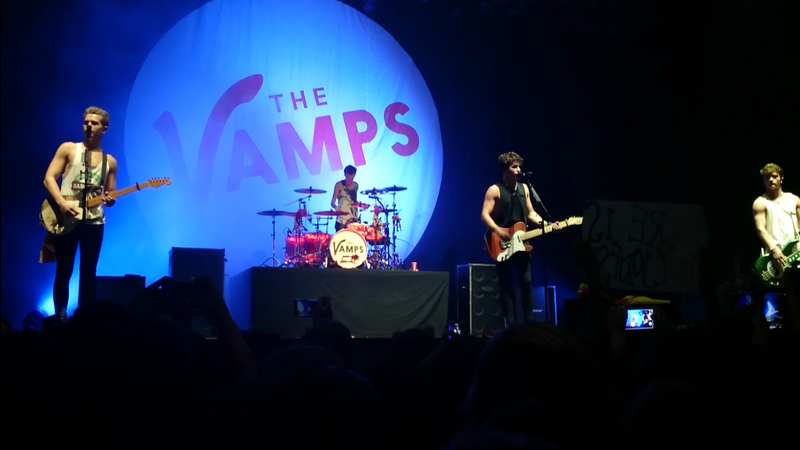 Then Tristan did an insanely good drum solo, it was so long and I enjoyed every single bit of it. 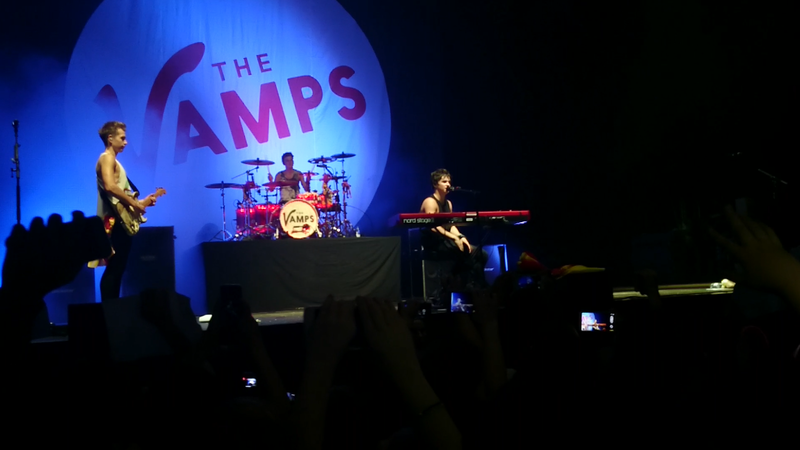 Later when Brad played Risk It All and played the piano I almost cried. He has a beautiful voice and that song is so perfect that it was just too much for me to handle. 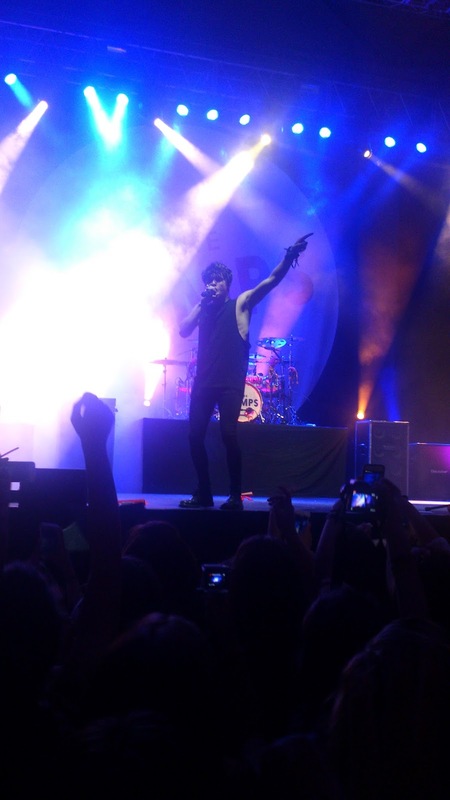 Once the concert was over I didn't want to leave, it had been an amazing day and I didn't want it to end. Before we left, we found a Coca-cola panel (the concert was sponsored by Coca-Cola) and a girl took a picture of the 4 of us which I'm not gonna share because you know, post concert pictures ain't the best. When I arrived home I didn't want the day to end so I watched the vids and photos I had taken until I fell asleep. Are you going to any concert soon? What was the last concert you went to?